LOM is featured in a Special Report, The Future Workplace, out in The Times today (6 July 2017). Our article discusses how the design of workplaces can improve efficiency while enhancing productivity and collaboration. Read an extract below. The ways in which people work are changing at pace. With more employees working flexibly or remotely, some office spaces are significantly underused, prompting a shift in the design of workplaces to improve productivity and empower collaboration. There has long been a desire to achieve the most from space in the workplace. This demand is ever-heightening, with office space typically occupied for less than five of every 24 hours throughout the year and remote working further reducing usage. For employers, this presents both challenges and opportunities. The efficiency drive has led to more desk-sharing – it is now not uncommon to have 1.5 full-time equivalent employees at a workspace – but managers are also conscious that such an intense environment can damage productivity. “Ultimately, rather than simply counting on efficiency alone, employers are looking for heightened productivity, but this can be difficult to measure and understand,” explains Simon Bird, director at architecture firm LOM. 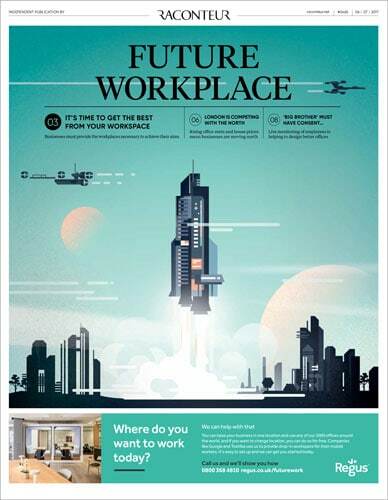 This article was originally seen in ‘Future Workplace’ report published by Raconteur in The Times on 6 July 2017. Read the full article Office space productivity transformation here.